July 2015, age 53. I awoke with numb fingertips, but within two days, my right arm, leg, abdomen was numb and tingly with my left foot starting to go. I was admitted to the hospital twice and discharged. As the symptoms spread up my left side I became scared. My right arm collapsed when raised, fingers “flopped” about like paper and I couldn’t hold anything. My bladder muscles’ “stop-start” ability was affected. My legs felt “watery” and weak as if wanting to go in opposite directions. I was admitted for observation, then discharged. In December 2015, I saw a neurologist who, after a full MRI scan and lumbar puncture, gave me a diagnosis of TM. After 10 months of being scared and depressed it was a relief! She advised me to “walk and walk more” to keep strong legs, use hand exercisers daily and have six month follow-ups. The difficulty for me is sensory issues. My hands have a layer of ‘crushed granules’ between my skin and anything I touch. I have varying numbness and lack of feeling from the elbows down (nicknamed my evening gloves). Soft things now feel like dead straw, running water feels dry, I have to hold washing to my face to feel if it is dry! For months showering was painful as the water felt like needles hitting my skin and I tried to avoid washing unless I really had to! The pressure under my fingernails make trimming them painful. Opening jars or bottles, using knives, tin opener, washing up etc. are all frustrating. I sometimes drop things without warning. Buttons, zips, laces are now an everyday ordeal. All the things we don’t normally think about. Explaining why you want a seat on a crowded train when you look fine but can’t hold on properly is interesting! I was worried I would not be able to continue in my job, but my company is incredibly supportive both in morale and confidence. After being off for 51 weeks, they allowed me a slow phased return and option to work two days a week from home. By agreement, my role slightly changed, but I still get to do everything I loved. It is frustrating I cannot type as fast as I used to, and make more mistakes but they are more patient with me than I am with myself. Some hobbies have had to change such as cross stitch as I can’t feel the needle, or crochet where the feel of the wool through my fingers is unpleasant. I still paint, just slower. Playing piano or guitar is frustrating but I will get there. Reading is difficult as paper feels like it’s slicing my skin but I love books not Kindles, so I persevere. I have started playing Xbox again but not for too long as my hand becomes number. Sometimes it feels like I am wearing baseball mitts!! My neurologist agreed with my main hobby, LARP, as it was good for me mentally and physically. 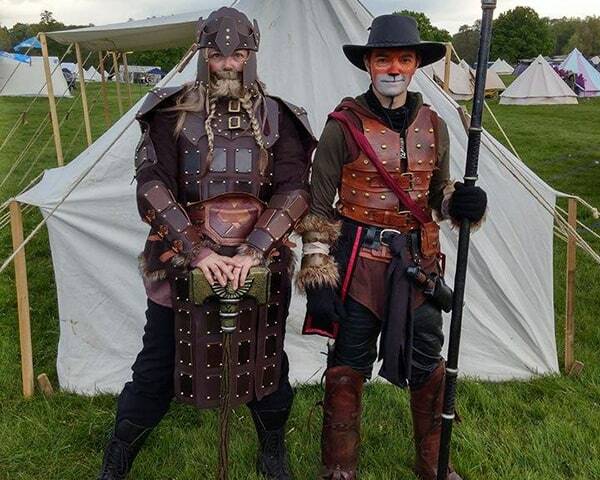 I do Live Action Role Play set in a fantasy medieval world. I play a female bearded dwarf mage in leather armour. I used to fight with a large hammer but cannot hold it now so rely on spell-casting! It’s very active. 14 hours game-play a day with many miles walked in a weekend focused me on how I can manage fatigue. I hope for reversal, or not getting worse, but am grateful that, at 54 years old, I have a condition that is forcing me to get fitter, slimmer and more active. I have just bought a bike having been threatened by friends with a cycling holiday next year so a future full of unexpected fun, thanks to TM!